The full name of Rodrigues is Eduardo Pereira Rodrigues. The nick name of Rodrigues is Dudu. Rodrigues is famous in the name Dudu. Rodrigues was born in the year 1992 January 7. The birth place of Rodrigues is Goiania, Brazil. Rodrigues is currently playing for Dynamo Kyiv which is a Ukraine club. His Jersey number for Dynamo Kyiv is 99. Rodrigues is an attacking midfielder who is having excellent skills in passing the ball and got excellent dribbling skills. 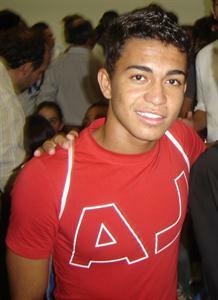 Rodrigues started his youth career for Cruzeiro Esporte Clube in June 2009. On April 2010, Rodrigues signed for Coritiba Foot Ball Club. In 2011 Rodrigues joined Dynamo Kyiv with an offer of €5 million. Rodrigues started his international career for Brazil under 20 and played 7 matches. Rodrigues just played 2 matches for Brazil national team but not scored any goals. He scored 3 goals in Brazil under 20 team. More details about the profile and career performance of Rodrigues are quoted in this article. "Dudu entered really well in the match. He is such a bold boy, intelligent, he doesn't forget the instructions. He is audacious, even being a little guy. It proves that tallness isn't really important for football. Quality, ability and competence are. He showed he is such a competent player, in spite of his young age." Rodrigues had just started his career and not played many matches. With his short career he showed some good performance for clubs and national team. Rodrigues played 7 matches in for Brazil under 20 and just 2 matches for Brazil team. Rodrigues played 3 matches for Dynamo Kyiv club and scored 1 goal. He scored 3 goals for Brazil under 20 team from 7 matches.